" The 'shopping helper' was very helpful!" With hope-filled storytelling, the moviemaking ministry of Sherwood Baptist Church continues touching the world from Albany, Georgia. After seven years of marriage, Caleb and Catherine Holt have drifted so far apart that they are ready to move on without each other. Yet as they prepare to enter divorce proceedings, Caleb's dad asks his son to try an experiment: The Love Dare, in hopes that it will restore their marriage. Fireproof opened in 839 theaters at No. 4 in the nation and was the number one independent film in theatrical release in 2008 as well as one of the top highest-grossing Christian films, along with Narnia and Amazing Grace, since The Passion of Christ. Facing The Giants is the heart-warming story of a downtrodden Christian high school football coach who turns to God when everything seems to be going against him. Trusting God to do the impossible, Coach Grant Taylor and his Shiloh Christian Eagles soon discover how faith plays out on the field … and off. Jay Austin wants to sell used cars in the worst way... and that's exactly how he does business at his dealership. Promising much more than he can ever deliver, he'll do whatever it takes to sell a car. His manipulative ways permeate all of his relationships - even his wife and son know they can't trust him. To view individual trailers or to purchase any of these films separately see the links below. 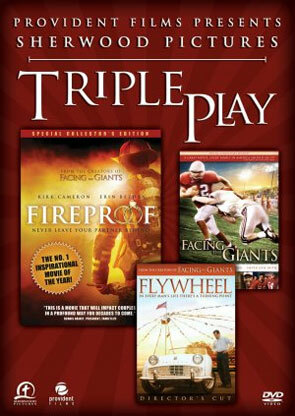 Fireproof and Facing The Giants are both Closed-Captioned and are Region 1. Flywheel is not Closed-Captioned and is Region 0 (All-Region). Format: DVD - Region 1 (3 Discs) What's a Region Code? From the creators of Facing The Giants , the newly edited Director's Cut of their first movie. i bought it because they are about Jesus and family friendly. All three movies are awesome. They deliver powerful Christian messages. Including the need for Salvation,the power of prayer, and living in faith and love.